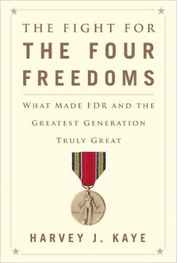 Harvey J. Kaye is the Ben & Joyce Rosenberg Professor of Democracy and Justice Studies at the University of Wisconsin-Green Bay and the author of Thomas Paine and the Promise of America (FSG, 2005) and The Fight for the Four Freedoms: What Made FDR and the Greatest Generation Truly Great (Simon & Schuster, April 2014). He is currently writing “Radicals at Heart: Why Americans Should Embrace their Radical History” (for The New Press). Follow him on Twitter. The time has come. After forty years of class war from above – of conservative political ascendance, neoliberal public policies, and well-funded culture wars that together have subordinated the public good to private greed, made the rich grossly richer, and led so many of us to deny our democratic impulses and yearnings – Americans are stirring. The time has come for progressive historians and intellectuals to join with their fellow citizens in the making of a new American narrative. Still, for all of our solid and promising scholarship, we failed to produce the called-for narrative. As Joyce Appleby, Lynn Hunt, and Margaret Jacob wrote in 2004, in Telling the Truth About History: “[We] now confront the task of creating a new narrative framework.” And a dozen years later, Gutman’s original challenge still stands. It was to be expected. We can put together innovative textbooks and compose wonderful epic works, but we cannot on our own turn them into grand narratives. Doing so depends not just on the writing of history, but all the more on the making of history, whether from above or, as progressives surely would hope, from below. Now, however, as more and more of our fellow citizens are showing a growing determination to do just that, we no longer have reason to simply lament. The time has come to renew our efforts. Americans, especially young people, recognize that the nation’s historic purpose and promise has been sequestered and plutocracy has trumped democracy. They are rejecting the narratives of both the Republican and Democratic establishments – narratives that have bolstered corporate ambitions, empowered the right to not only take complete control of the GOP, but also regularly dictate terms in public life and legislation, and enabled neoliberals to subject the “People’s Party” to the Money Power. 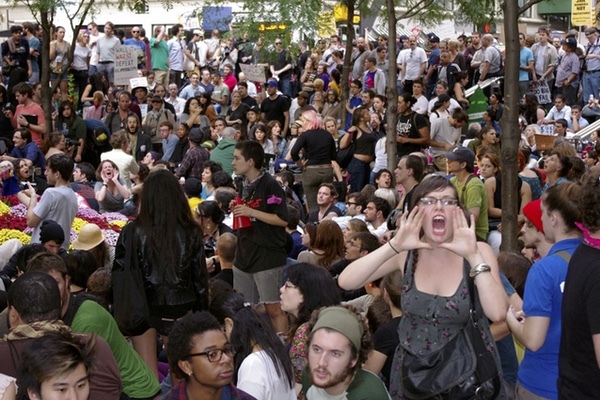 We viewed the beginnings of the grand rejection in 2011 in the ill-fated Wisconsin Rising and Occupy Wall Street movement. We witnessed it come back to life in the Fight for $15, the anti-fracking campaigns, the Dreamers and immigrant rights struggle, the Chicago Teachers and Verizon strikes, the Moral Monday movement, Black Lives Matter, and Democracy Awakening. And we have seen it in the 2013 election victories of progressive candidates in cities around the country, in the enthusiasm for Elizabeth Warren’s populism, and especially, in the massive turnout this year for Bernie Sanders’ progressive and social-democratic presidential campaign – not to mention the angry and ugly popular support for Donald Trump. However divided Americans remain, they want to redeem the nation’s promise ­– and a majority want radical action in favor of it. Conservatives and neoliberals always understood that. Which makes our task all the more challenging. Determined to undo or undermine the democratic achievements and advances of the 1960s Great Society and War on Poverty – if not those of the 1930s New Deal, as well – and to stymie the ongoing struggles of workers, women, and people of color, “New Right” politicians, pundits, and public intellectuals, led by actor-turned-politician Ronald Reagan, made the use and abuse of the history a hallmark of their political campaigns. Sensing Americans’ post-sixties anxieties and fears, they conjured up a nostalgic past of hardworking, God-fearing, family-oriented, and patriotic citizens and promised to “make America great again.” Appreciating Americans’ deepest beliefs, they hijacked the “Founding Fathers,” Stars and Stripes, and idea of American Exceptionalism, stripped them of their revolutionary lives, histories, and meanings, and wrapped them around their calls to cut taxes, limit government, deregulate business, shrink welfare, restore school prayer, end a woman’s right to choose, and restore states’ rights. And recognizing the need to shape the historical memory and imagination of upcoming generations, they set out to conservatively reconstitute history and humanities education. Neoliberal Democrats such as Jimmy Carter, Bill Clinton, and Barack Obama offered no real serious challenge to the conservative storytelling. In fact, on questions of political economy and public policy, they echoed it and sought to live up to it. Carter actually pioneered the “Reagan Revolution.” Declaring that “Government cannot solve our problems,” he turned his back on both the liberal tradition of Franklin Roosevelt and the labor and consumer movements and initiated policies of “national austerity” and corporate and financial deregulation. Following suit, Clinton betrayed labor and the environmental movement; enacted the North American Free Trade Agreement (NAFTA); set out to “downsize government;” ended “welfare as we know it;” and signed off on deregulating the communications and banking industries. And as much as Obama responded to the Great Recession of 2008-2009 by launching massive spending programs and went on to secure passage of the corporate-friendly Affordable Care Act (aka “Obamacare”), he too not only turned his back on labor and pushed for enactment of the free-trade TPP (Trans-Pacific Partnership), but also – preaching the need for “Government…to start living within its means” – created a National Commission on Fiscal Responsibility and announced he was ready to “put everything on the table [viz. Social Security and Medicare]” in order to make a deal with congressional Republicans on reducing the deficit. Moreover, while Obama has spoken often and proudly of his “Greatest Generation” grandparents, he has emptied their generation’s experience of its progressive agencies and achievements. Utterly ignoring how those men and women and President Roosevelt subjected big business to public account and regulation, empowered the federal government to address the needs of working people, organized labor unions, fought for their rights, established a Social Security system, mobilized to both rebuild the nation’s public infrastructure and improve the environment, and went on to fight for the Four Freedoms, Obama has proffered a truly Reaganesque rendition of history in which the Greatest Generation “triumphed over the Great Depression and over Fascism,” and “gave rise to the middle class and the strongest economy the world has known” because of its “values.” And when he has spoken of our widening class inequality, he has continually ignored the long class war from above and what it has wrought, and cited as culprits the forces of technological change and globalization. Now, however, after decades of enduring narratives and histories that deny America’s democratic imperative and dampen our democratic impulses and yearnings, Americans themselves are, by their own actions, beginning to make possible a new narrative. We are seeing the return of history and witnessing the resurgence of democratic possibilities. Ever attentive, conservative are growing anxious, and some are even calling for a new narrative. Meanwhile, Democrats are rediscovering their greatest and most progressive leader. Hoping to identify herself with Franklin Roosevelt and the Fighting Faith age of liberalism, Hillary Clinton launched her bid for the presidential nomination at the FDR Four Freedoms Park in New York; and in a speech at Georgetown University, Bernie Sanders explained his “democratic socialism” by discussing FDR’s 1944 Economic Bill of Rights speech. We must cultivate a narrative that affirms and encourages democratic hopes, aspirations, and energies. A narrative that – without failing to recognize the exploitation and oppression that has marked the lives so many generations – reclaims and recalls America’s revolutionary, radical, and progressive past, reveals how our finest presidents, Washington, Lincoln, and FDR, were made so by great democratic surges and movements, and shows that, for all of our terrible and tragic faults and failings, we are radicals at heart and that to make America great again we must further enhance democracy not diminish it. Indeed, a narrative that, without making promises of victory, shows that what truly has made America great and American history exceptional is that when we have confronted crises, mortal crises – as we did in the 1770s, the 1860s, the 1930s and 1940s, and the 1960s – we did not, contrary to conservative urgings and historical expectations, give up or suspend our finest ideals but made America freer, more equal, and more democratic. We must cultivate a narrative that will help us remember not only that we did all of that in the past, but also that we might do just that once again.